Finally, we can reveal the five puddings we’ll be serving today to the lucky 20 attendees at #MissiesPudInn from 3pm – 6pm TODAY. 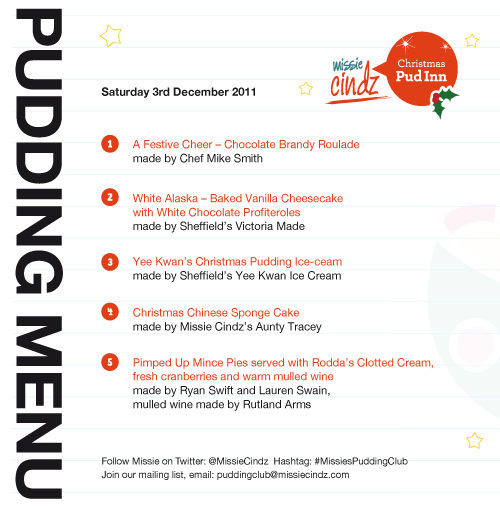 You can download today’s Missie Cindz Pud Inn Menu for your reference and safe-keeps. I hope attendees will enjoy the line-up of treats I have planned for them this afternoon, look out for all the photos and tweets from us later today – hopefully there will be lots of LIVE tweets from everyone, especially those who were lucky enough to pick up a ticket for a spoon (i.e. ticket)! I hope you have also read and seen the Twitter Competition I’ve put together with the Rutland Arms for today? See yesterdays blog post: Rutland Arms Twitter Competition and WIN a FREE lunch and drink at their pub. For those who aren’t too sure what Missie’s (Cindy’s) Pud Inn event are, a Missie Cindz Pud Inn serves up a five-course pudding set menu, with a different theme for each event. This time round the theme is ‘Christmas’. Clubs are seasonal events I curate to bring back the wholesome ‘Pudding/dessert’ – I liked the idea of a Pudding gathering because they’re socially fun and you can chat to people over mouthfuls of sweet goodness – plus, I love all things sweetly made in Sheffield anyway. Each event showcases at least one Pudding that is deliciously made by a Sheffield food-related business or artisan baker. Today’s Pud Inn features Sheffield’s Victoria Made Cakes, Yee Kwan Ice Cream and the Rutland Arms head-chef, Chef Mike plus two made by pudding loving fans, Ryan Swift, Lauren Swain and my good ol’ aunty Tracey :) A big thank you to our star guest Pudding makers for today’s treats – without your help my event today wouldn’t be possible…. There are only 20 places available at each Pud event so to join us, you must book and purchase tickets early. Tickets can be purchased from the Rutland Arms bar, the event venue (Brown Street, Sheffield) or send Cindy Cheung, the event organiser (and Pud Lover), an email to: puddingclub@missiecindz.com. I’m sorry to those who weren’t able to purchase tickets for today’s event but I’ll be planning the next shortly after this one so please do make sure you book early, we’d hate you to miss out on the fun. My sugar levels are going to spiked today I can just tell – see you pudding attendees later!